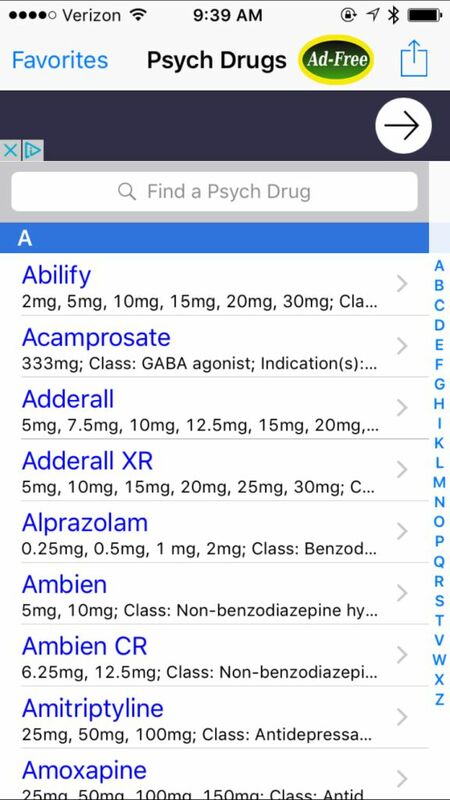 The Psych Drugs and Medications app is a simple, straightforward medical app that is as promised: a drug reference app for psychiatric medications, but reliability is an issue. 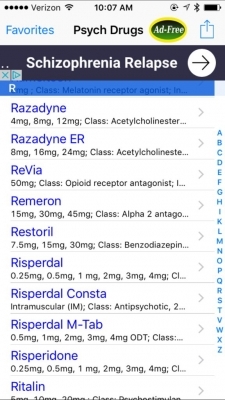 A good point-of-care drug reference app is a must have for every clinician. We recently updated our review of the Epocrates app, one great resource. 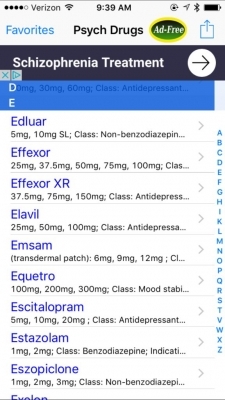 There are also a growing body of drug reference apps for patients like Iodine, which provides some curated patient-friendly information on medications (though its crowd-sourced content has some issues). 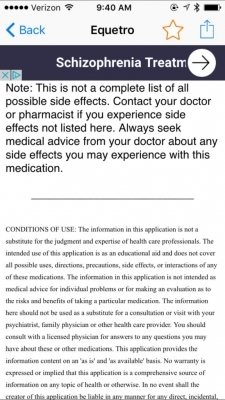 The latter is what the Psych Drugs and Medications app aims to be – a plain-language reference for patients. Drug information is presented in patient language with medications listed alphabetically by brand name. 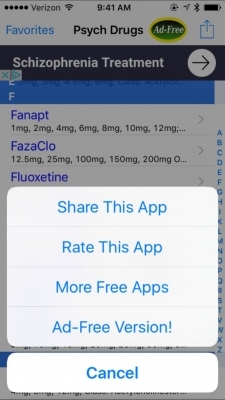 Doses and drug class are also included on the home screen. Each drug listing in the Psych Drugs and Medications app includes the brand and generic drug names, drug class, indications, dosage forms, maximum daily dosage, half-life, and a list of adverse effects. It’s not clear how this specific information was chosen for inclusion. 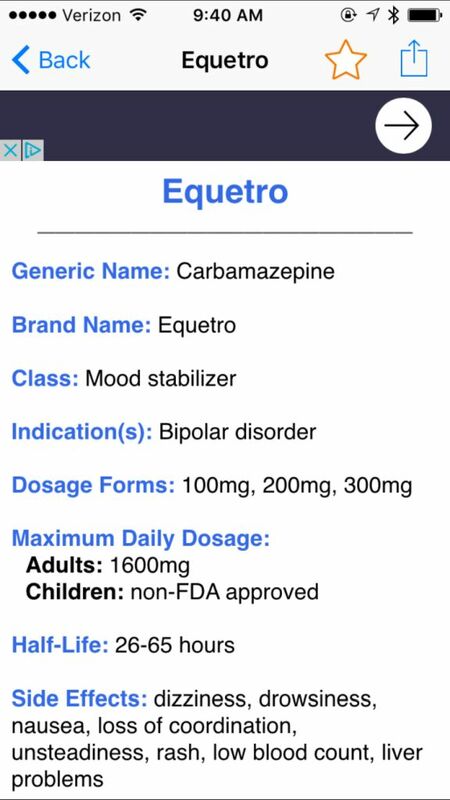 For example, carbamazepine as Equetro is indicated for bipolar disorder, however, it’s a known antiepileptic drug with a whole host of drug interactions, adverse effects, and warnings associated with its use that aren’t mentioned by the app. There are no references or sources listed either so there’s no way to tell from where the information was derived. 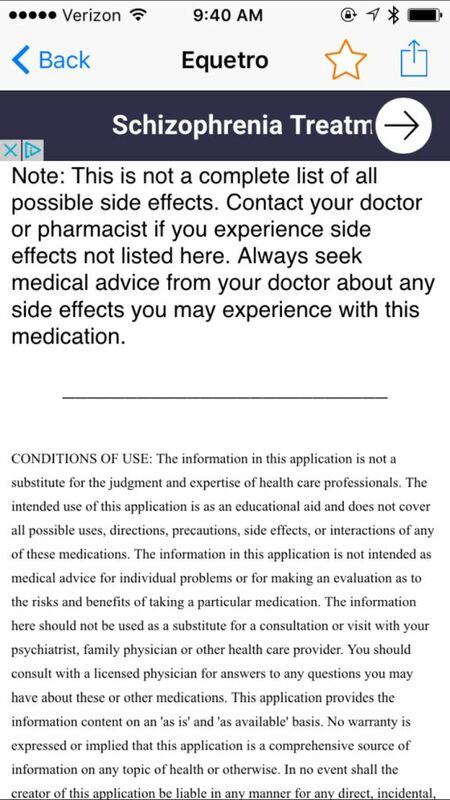 A disclaimer is included that states this medical app does not present a complete list of side effects, but it seems something as important as the pregnancy warnings associated with this drug should not have been left out when choosing which adverse effects to include. Additionally, the information in Psych Drugs and Medications is not entirely accurate in some cases. 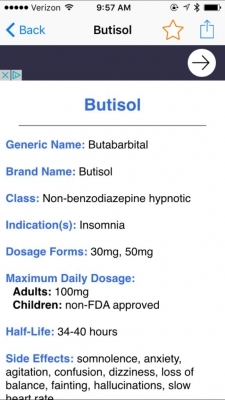 The listing for Butisol includes a 50 mg dose. 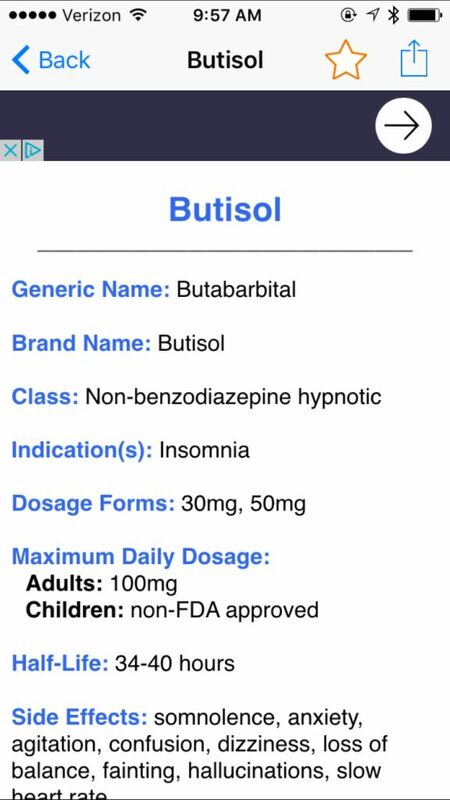 Butisol is not available in the U.S. as a 50 mg dose and doesn’t appear it ever was based on information found in the FDA website. 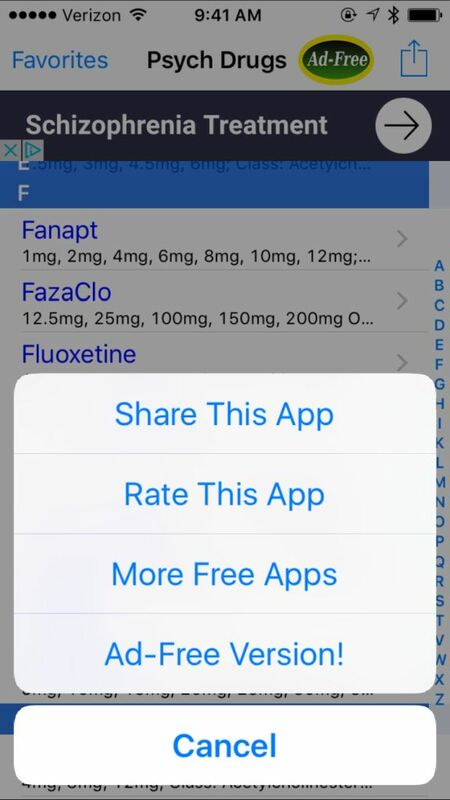 This medical app also hasn’t been updated since 2014 which means it’s missing newly-approved drugs like Rexulti which is currently seeing heavy rotation in TV commercials and might be something where a patient would turn to the app for more information. 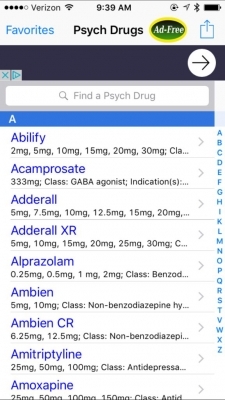 The Psych Drugs and Medications app is also fairly ad heavy. 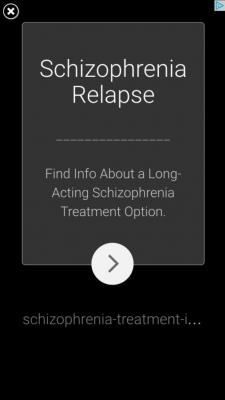 There’s a banner ad at the top of each page and occasional pop-up ads as well. Users can purchase an ad-free version of the app for $2.99. While this streamlined approach to a complicated group of drugs seems like a good idea, unfortunately, the app does not provide comprehensive information or any sense of references used. Information is incomplete, inaccurate and outdated. Patients would be better served using something like Drugs.com or WebMD for drug information. Easy to use but ads are a problem. Free, but in this case, you get what you pay for. 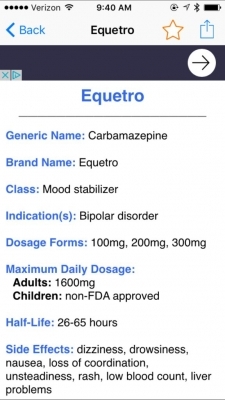 The app is good for a list of psychiatric medications, but the information presented is unreliable. Melissa Murfin is a physician assistant and a pharmacist who currently teaches pharmacology and pharmacotherapeutics to physician assistant students at Elon University. She has a passion for evidence-based medicine and hopes to help healthcare providers determine the accuracy of medical apps, particularly when used to make treatment decisions for patients.